This article is a review of LA PISCINE. I can see why Francois Ozon riffed on LA PISCINE with SWIMMING POOL. This re-release of the 1969 French pic oozes a sexual frisson too rarely caught on the silver screen. Adults at play in a world of beauty and boredom and jealousy. Imagination is toyed with, for both the players and the audience. This is essentially a four-hander, which starts as a romantic paradise, and is soon corrupted by the sadder sides of human nature. 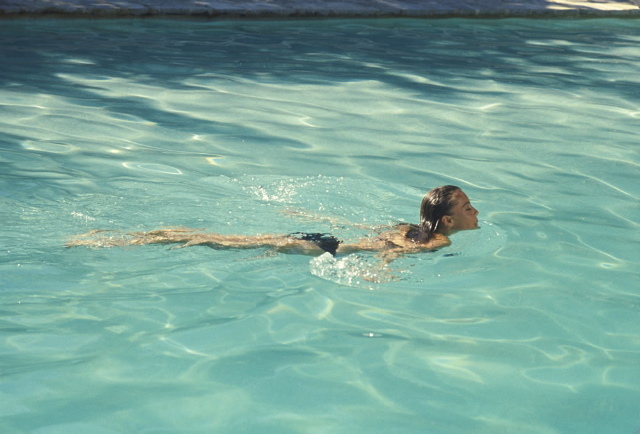 Opening with Alain Delon’s Jean-Paul sunbathing by a luxurious pool, by a gorgeous house in a picturesque setting near St. Tropez, we are then introduced to the equally stunning Marianne (Romy Schneider). Their lust for one another in the heat of the summer threatens to set the film stock on fire. The pool does the opposite of cool, it provides an excuse for disrobing to alluring swimming attire, and is almost a pagan alter to the religion of lust and passion. The idyll is broken with a phone call, which had it been ignored peace would’ve probably been preserved. And these characters have little of that, including the two that join them. The call is from Harry (Maurice Ronet), an old friend of Jean-Paul’s, and an ex of Marianne. He’s in the area with his daughter Penelope (Jane Birkin) in tow, and she tells them to visit their abode. The father-daughter guests once there are invited to stay for a few days. These offers seem ostensibly innocent. However, the undercurrents of ulterior motives sit tensely under the surface with everything all the characters say and do. This sets in motion a compelling look at friendship, fidelity and lust. Male rivalry and the fragility of ego are really put under the camera’s glare. The analysis is intriguing.